Spring is quickly approaching which becomes my favourite season for using the different blushes in my collection. This post is a battle of the blushes, comparing the different ones I own and swatches of how they look on the skin and how appropriate they are for different looks, longevity and versatility. From baby pinks to dark coral, I’ll be letting you know my favourites blushes for spring so keep reading to find out where they are from and how I rate them. #1) Mua baby pink blush. MUA is a Superdrug own brand that is incredibly affordable (I believe this cost only £1). I have owned this blush for quite a while and you can see, it is incredibly well loved as it is one of the two blushes I own that have hit pan (although there is something weirdly satisfying about finishing up a product). This is the pinkest shade of my collection and I love using it for a very faint, light pink glow to the cheeks. With my pale skin (Mac NC15 for reference) this is incredibly versatile and can be built up for a more intense look but a light dusting on my cheeks provides a very light but healthy pink to my cheeks. I get a good 4 hours out of this blush, the more I put on the longer it wears, but for £1, you really can’t complain. I’d really recommend this plus Superdrug has such a large range of shades I’m sure you can find any blush to suit your complexion. The blush quad is made by Fate Cosmetics and was actually something I purchased from Poundland one morning I forgot my makeup on my way to Rich’s in my first year at uni and figured something was better than nothing. I expected to use this as an emergency on that day and never wear it again but was pleasantly surprised by how much I reached for this. The coral shade is the one I have hit pan on and is my favourite from the set. I don’t have another coral shade and always mean to grab one from Tarte, but to be honest, this lasts about 6 hours on my face which is amazing considering I bought it on a total whim. I love reaching for this for a more intense look but again can be built up for the desired look. #3) Fate light pink shade. Another blush from the £1 quad and this lacks pigment to the point I can’t remember when I last used this. To get it to show up I really had to build it up and it didn’t even last 2 hours without fading, maybe 3 with a setting spray. if you’re looking for a light, affordable shade then I’d recommend the MUA collection more than this. This is hands down my favourite blush that I own. It’s like the Fate coral shade but more pink in tone and is much more pigmented. All you need is a very light brush over with this blush and you’ll get a solid 8 hours of wear. I used this so much over the Autumn and can tell I’ll gravitate for it throughout Spring/Summer. 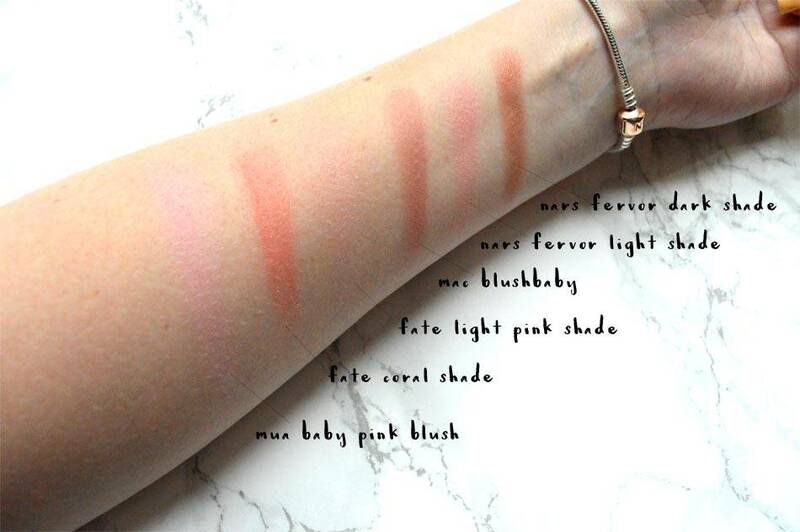 When looking for a Mac blush I was overwhelmed by the choice of blushes but blushbaby swatched beautifully and can be used lightly on pale skin or built up for darker skin and gives such a beautiful yet natural finish. I bought this along with my massive mac haul which can be found here for £18.50 and although on the expensive side, you get a lot of product that is incredibly high in quality. Blushes last me so long and I know this will remain a firm fav – definitely recommend a Mac blush if you don’t own one already! #5) Nars dual intensity fervor light shade. My favourite of the light shades in my collection, this is a fantastic everyday blush regardless of the rest of your makeup. The dual intensity blushes can be used in the normal way to create a very light, natural finish and can also be used with a damp brush to intensify the look, much like the infamous Nars eyeshadows. I wrote an in-depth review of this blush here and my love remains for this shade. This will last all day and I often get complimented when wearing this which is a great sign. #6) Nars dual intensity fervor dark shade. The second shade in the blush duo. This is a much darker, brown toned blush that can be used not only as a blush I’d say on darker skin but I reach for this to contour as it blends out to a much lighter version of itself. That said, I don’t use this shade half as much as I should. It swatches so amazingly and even writing this I question why I don’t more. In all honesty, after paying £24 for this (during an Asos 20% student discount) I kinda wish I had picked up Adoration instead but this is perfect for travelling and I’m sure I’ll add that to my collection in the not so long future. I’m a sucker for Nars packaging and you really get what you pay for in regards to pigmentation and longevity. 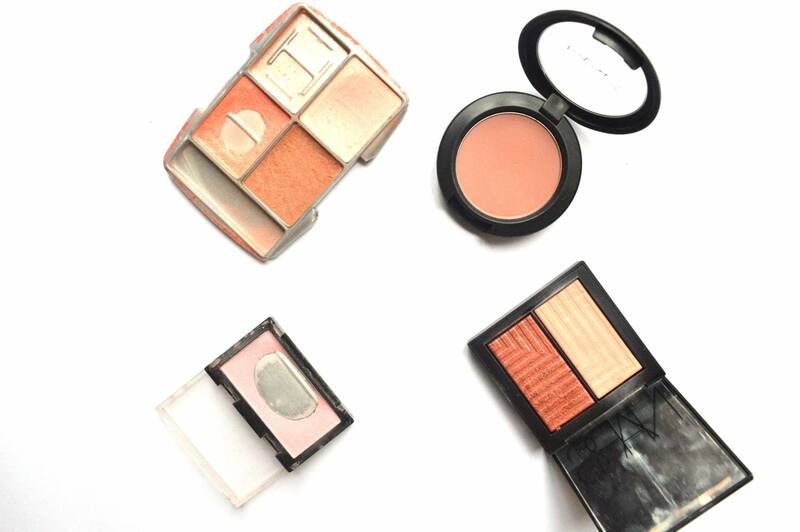 Have you tried any of these blushes or have any recommendations? Do let me know! Review – Nars Dual Intensity Blush / Massive Mac Haul / Review – Barry M Contour Kit. Previous Post Real Techniques Bold Metal Brushes – Complete Set! Next Post 10 Ways To Double Your Instagram Followers!